The complex cave and rock shelters of Laas Geel, Dhagah Kureh, and Dhagah Nabi Galay lie just 30-45 minutes outside of Hargeisa, the capital of Somaliland, a self-declared republic and autonomous region of Somalia. Exhibiting outstanding Neolithic rock art, the sites’ cave paints are considered to be some of the best preserved rock paintings in all of Africa, and are essential to the Horn of Africa’s historical and heritage legacy. Photograph of field team member utilising low cost software and technologies to digitally capture the paintings of dhagah-kureh (Photo: ICCROM, Horn Heritage Organisation/CyArk). 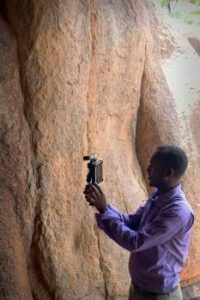 OPEN ACCESS Mire & S (2013), Rock Art Sites of Somaliland: 3D, Virtual Reality (VR) and Multimedia Community Capacity Building and Documentation of Laas Geel, Nagah Nabi Galay and Dhagah Kureh: Horn Heritage Organisation, CyArk and ICCROM. Related publications Mire S. (2008), The Discovery of Dhambalin Rock Art Site, Somaliland, African Archaeological Review 25(3-4): 153-168. OPEN ACCESS Mire S. (2015), Mapping the Archaeology of Somaliland: Religion, Art, Script, Time, Urbanism, Trade and Empire, African Archaeological Review 32(1): 111-136.